For a British & Irish Lions fan like me, the drawn series in New Zealand was at times thrilling, frustrating, surprising and a relief. Yet, I’m left feeling that the All Black machine will adjust and roll on relentlessly, their dominance undiminished – after all, in 240 minutes of play, over 3 tests, the Lions only led for 3 minutes. The ABs have had setbacks on the way to becoming the force they are today, but have found a way to use disappointment to their advantage. This interview, with former All Blacks Captain Anton Oliver, explains how their identity underpins their resilience and is as relevant today as it was when I conducted it 4 years ago. The All Blacks led the way in sport by rebooting their identity and culture to drive performance more than a decade ago. Many teams have tried to copy them and failed because they do not understand the psychological processes at work. As Anton explains, teams can be superficially tight, but lack the bone-deep emotional connection to the team, needed when the pressure is on. Jeremy Holt (JH): I would say that team identity is the critical element in all teams, but particularly sports teams. What I mean by “team identity” is the psychological significance that belonging to the team has for members. So I assume that in a team like the All Blacks with a strong identity, membership of the team becomes part of a player’s personal identity – his sense of who he is and the success of the team has a direct effect on his self- esteem. Was that your experience? Anton Oliver (AO): When I was first selected for the All Blacks I was 19 and it was an amazing honour. During the 13 years I played for them being an All Black was a massive part of who I was, so yes I would agree. JH: As a result you will do what ever you can, even sacrificing yourself, to ensure the success of the team. Did the team’s success become more important to you than your own success? AO: That’s a tricky one! I think when you’re new to the team and young, all you’re concerned about is yourself and your own performance. It’s great to be part of the team but it doesn’t really feel like your team yet because you haven’t spent enough time in the jersey and you haven’t earned your spot. Over time that changes and when you’re old there’s more of a feeling of ownership and being a custodian – which is where sentiments for team performance can trump individual aspirations. In saying that, a player has always got to be good enough and the best in his/her position to be there: when you lose sight of your number one priority – to be the best in your position – then you’re in trouble. JH: So what impact did the All Black identity have? AO: The team identity had a huge effect on performance. In the early part of the 2000s the All Blacks went through a period of inconsistent performance. 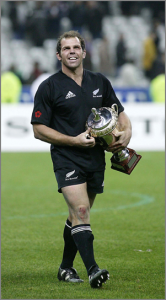 We finally identified that it wasn’t clear what it meant to be an All Black in the new millennium – the players and environment were so very different post professionalism that we had lost our way: what used to be relevant no longer was. So we set about understanding what it meant to be an All Black today and untangle ourselves from the many historical cultural yolks that had set in stone what the All Blacks were supposed to be – stopping any chance at team growth. We wanted the past to ignite, not crush us and so we reframed the past as something that helped us but didn’t define us. Our job was to add to the legacy now, not to defend it – which took us out of a defensive, negative mindset to a creative, empowering constructive one. We changed many things. Most notably the public saw a new Haka in 2005, which was created by the team to speak for us in this present moment – freeing the team from expectations of the past and empowering us with positive emotions going forward. Crucial to this was the recognition that while our history of excellence was something to be very proud about, it also created a huge amount of pressure and expectation – over one hundred years in fact. We wanted the past to ignite, not crush us and so we reframed the past as something that helped us but didn’t define us. Our job was to add to the legacy now, not to defend it – which took us out of a defensive, negative mindset to a creative, empowering constructive one. JH: Not all teams have an identity that is meaningful to the players and then two situations play out. In the first the team lacks any strong identity – it is not meaningful enough for players to put the team first, so they pursue their own interests. You see “prima donnas”, bad behaviour and frequent transfers as players seek something more meaningful. In clubs players are paid over the odds to attract them – Madrid and the Galacticos spring to mind – and when they leave managers complain they didn’t fit in, or have failed to adapt. In the second situation there is an identity, but it’s not compelling enough to make sense to all the team. So you get cliques and politics – there is an “in-group” who align with the team and an out-group, who feel they haven’t been treated fairly and are being excluded. Both situations undermine performance but did you see either in the All Blacks? AO: In the All Blacks we always had a strong historic identity but when the game went professional many things changed. Initially management created motivational themes that didn’t work for two reasons. Firstly, and obviously, the motivation came from non-players; it was never going to connect. Secondly, it was a kind of ‘pre- prepared’ motivational hit in only one form. If you didn’t connect to it then you were lost. It just might work in teams that have just one demographic: all the same race, age, etc. but in the All Blacks we had players from many different cultural backgrounds so this narrow prescriptive approach was never going to capture the whole team. We then moved to something that was created from within and was more of an open platform that players could plug into from wherever they were and derive their own meaning in their own subjective way. For a few years of my career, I played through a less successful period in All Black history when we lost the big games and there was a high turnover of players and management: no consistency. It became apparent that some of our top players were performing better for their clubs than for their country. We realised that club environments, cultures, identities and the desire to play were all superior to the All Blacks – something was definitely wrong. It basically boiled down to the team’s culture – it wasn’t right and as a consequence when the heat was on, we didn’t deliver. And we didn’t have the resilience to handle the immense pressure that is ever- present: most especially after a loss. Our identity and our culture focused on the wrong things, which undermined performance. Sure we were still a tight team but on reflection it was superficial because in the critical moments, we didn’t deliver for each other – and that’s the ultimate barometer of a successful, high performance team culture: going to the dark places together and emerging still as one with the right result. Sometimes still being together is the right result irrespective of what the scoreboard says. JH: Anton you’re right, it’s not enough to have a strong identity, it has to be aligned to performance, however you define it. And the key word here is “you”. An organisation can define success as winning every game but the players may have a very different view of what performance is. It’s possible to get a siege mentality and then bad decisions are made. Teams that feel under siege stop paying attention to what’s going on outside and just focus on their own needs. They get out of step with the wider world, frustrate the hell out of their supporters and sponsors and ultimately implode. AO: Jay, that’s not always true. There are lots of teams that have made a virtue of a siege mentality. Isn’t Sir Alex Fergusson a master of it and didn’t Mourinho “the chosen one” use it to good effect? JH: But they are managers who have a real skill for creating a performance-focused identity in the first place. They play the “under siege” card to up the intensity on players to commit more. I don’t know if it is conscious or not, but I think that is why it works. AO: The coach and captain need to be certain that the players have the individual and collective cognitive skills to handle that siege – if they don’t they’ll surely fail to control and win the big games. I asked Richie McCaw the current All Black captain how they handled the pressure of the Rugby World Cup (RWC) at home in New Zealand and he said they did a lot of work before the campaign preparing for the inevitable siege: developing and preparing for the very worst of events; exhaustive contingency planning; controlling one’s own mental state when things aren’t going so well. The team and management recognised the ‘business as usual’ approach that had worked so well in the 4 years between RWCs – focusing on process and letting the outcome take care of itself – hadn’t worked in the previous RWCs because rare, random and bizarre occurrences happen in RWCs derailing teams especially at knockout time. It paid off when the All Black’s star player got injured then his back-up, then his back-up and then his back- up to the point where the All Black’s fifth choice player in that position kicked the goal that won the RWC. The team had prepared itself for any eventuality and faced with an unheard of run of injuries in the same position, didn’t get flustered and just delivered. JH: So the key is to have an identity that defines success as something within your control. Psychologists would say that what stops people psychologically “checking out” from their commitment to a team is a strong belief that they can influence the team’s success. If success is defined as winning then you can never be in control because there is always an opposition that might play out of their skins. If success is to play to the best of your ability then when you are successful you will win every match you should have. It also totally changes your approach to training if success is to always be the best you can be. AO: Jay you’re careful to talk about success and not winning and I agree. In fact sometimes focusing on winning becomes a noose round your neck. In my time with the All Blacks that distinction was important. Lots of young sports men and women begin their careers simply wanting to learn and be the best they can. Unfortunately in many teams this story changes to something less aspirational as they get lost in the day-to-day story of the team they have joined. This is as true in elite individual sports as it is in team sports. In the All Blacks we learnt how to make sure the day-to-day story met our aspirations to add value to the jersey and supported our performance. We didn’t always get that right but that’s the general aspiration. A quick glance at the British elite teams in cycling, sailing and rowing reinforces that this is what happens in successful teams. Under pinning everything is the story that people use to explain what is going on, or Jay, as you call it, the team’s identity.